Your Source for Meal Prep Tips, Tricks, and Recipes! Stay up to date with MealPrepSunday! I’m a longtime reddit lurker, not so much of an “OP” (original poster). I was doing my nightime lurking last night when I decided to post a picture of my Sunday meal prep in /r/fitmeals. I wasn’t expecting many people to see it but thought it would be neat to see what people thought. I woke up in the morning and had 3000 upvotes and 350k views on imgur! I was shocked to say the least. A lot of people started asking questions about how I prep my meals, recipes I use, etc. I created a follow-up post detailing everything and I thought I would re-post it here as well. HOW DO I MEAL PREP!? 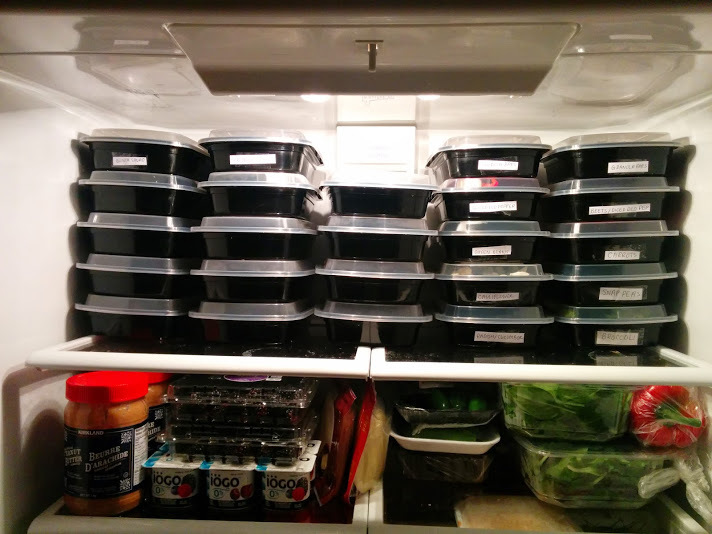 For obvious reasons, planning is key when it comes to meal prepping. Keeping things organized will make for the quickest and easiest prep. First things first, decide on what your nutritional goals are. Your meal prep is going to be significantly different if you’re an 18 year old girl trying to get healthy vs. a 32 year old guy trying to get in those gains. Once you’ve decided on your meals for the week and have bought all the necessary ingredients, it’s time to cook. I cook in the following order: meats, carbs, veggies. I like to get all the meat out of the way first. Your oven is your best friend. It’s the cleanest and quickest way to get your meat cooked. It’s going to get super time consuming and messy if you cook everything on the stove. For the meal prep in the photo that I posted, I roasted two whole chickens (ate some for dinner that night) and made mini meatballs out of lean ground beef (also baked). The meat takes a while to cook which leaves you with time to get other things done. If you’re going with quinoa, brown rice, pasta, or any other carb that needs to be boiled then that should be step 2. Set timers or write down times so you know how long everything has been cooking. Try to keep this chaos as organized as possible! If you’re cooking up some sweet potato, now is the time to clean, peel, and chop. Get it chopped, seasoned and on a baking tray so that you can pop it in the oven once the meat is done. Clean, cut, and season your veggies. If you’re going to cook them on the stove, do it now! If you’re going to roast them, prep them so that they’re ready to go in the oven once the meat is out. 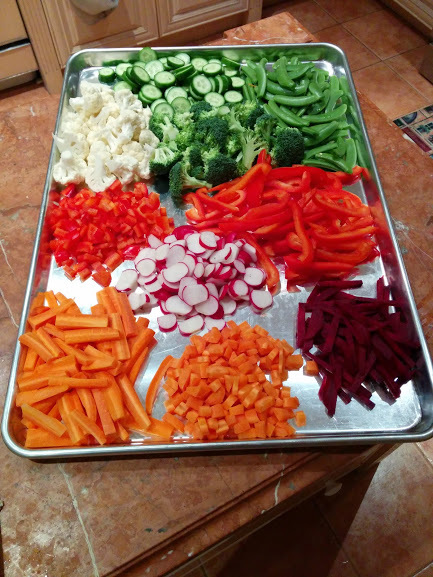 FYI – I prep ALL my veggies for the week on Sunday night. That’s why there’s containers of carrots and whatnot. If you keep everything washed and cut, it literally takes a few minutes to put a meal together. A salad or stirfry will be quick, easy, and best of all…. you’ll have ZERO mess. It’s also great for when you’re looking for something to munch on. If your veggies are clean and cut, you’re more likely to eat them. This is 3 days worth of lunches for 4 people + 1 week worth of granola bars for 4 + 1 week worth of washed and cut veggies for salads, stirfrys, and munching. The cut veggies are primarily used for dinners and salads. It’s quick and easy to prepare meals when all your ingredients are prepped and it’s just a matter of tossing them in. How do you store everything? / Where did you get your containers? I use food containers that I bought from a local restaurant supply shop. They are reusable, microwave and dishwasher safe, and BPA free. How do you store it in the fridge? See picture below. I know the first three columns are lunches for M,T, & W. The last two have veggies in them and are labeled. How do you store your veggies? I store them in plastic containers. The key is to ensure that they are completely dry before you store them. If you store them wet, they will surely spoil much faster. Veggies with a higher water content like bell peppers will not store as long as something like beets. But they should last you 5 days without a problem. To prepare everything pictured, it takes about 2 hours on Sunday. 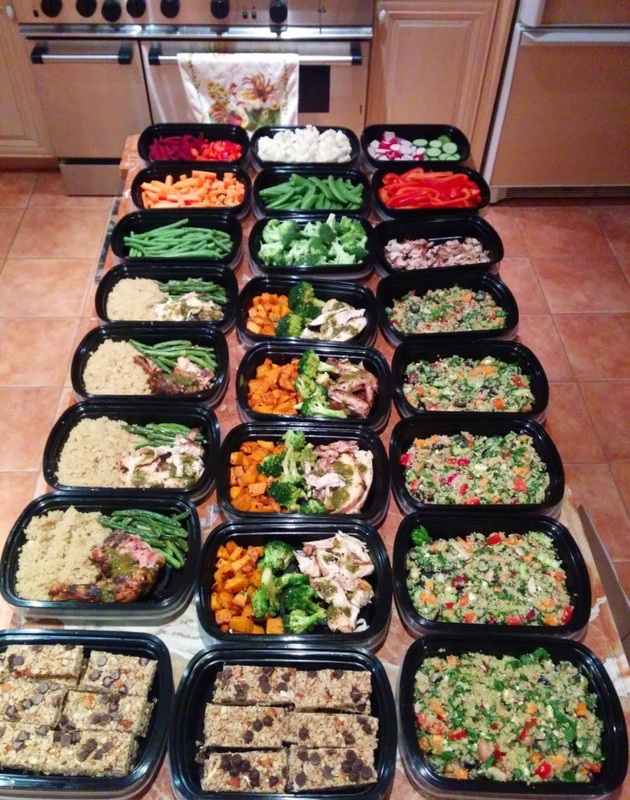 My mid-week meal prep on Wednesday takes about 45 minutes since the bulk of the prep is done on Sunday. What do I do on Wednesday? Good question. This meals in the picture will last M-W. On Wednesday, I’ll prep meals for T-F but because the majority of the prep was done on Sunday, it’s much faster with minimal clean up. I’ll usually cook up some more meat and roast some of the veggies that I washed and cut on Sunday. Quinoa and brown rice will stay good in the fridge until Friday so if you cook up a big batch on Sunday, it’s just a matter of portioning it in containers on Wednesday. Alternately, you could also cook up a new batch on Wednesday. Quinoa is my carb of choice and only takes 15 minutes to cook. I prefer to cook a new batch but there’s no harm in cooking a larger batch on Sunday. I didn’t calculate exact macros but these meals are probably around 300 calories per container. So a bit of a disclaimer: I don’t really use recipes. I look at recipes to get ideas and then just work with what I have. I’ve done my best to get them in recipe form! 1 Whole Chicken – I pull all of the skin off to get rid of the excess fat but you can keep it if you wish! Chimichurri Sauce – I made my own but you can find it at any local supermarket. Just make sure to keep an eye on the ingredients and the sodium content. I made it by grinding up some cilantro, thai chillis (I ❤ spice), parsley, oregano, and garlic with olive oil and red wine vinegar. I also added some cumin. I’ll try to keep track of proportions next time so that I can give you guys a recipe! Preheat oven to 450 F. Clean the chicken and create slits so that the sauce gets infused in the meat. Coat the chicken generously with the chimichurri sauce. Top with a little bit of olive oil if you removed the skin and still want a crispy outside. Cook for 50-60 minutes until the internal temperature reaches 165. 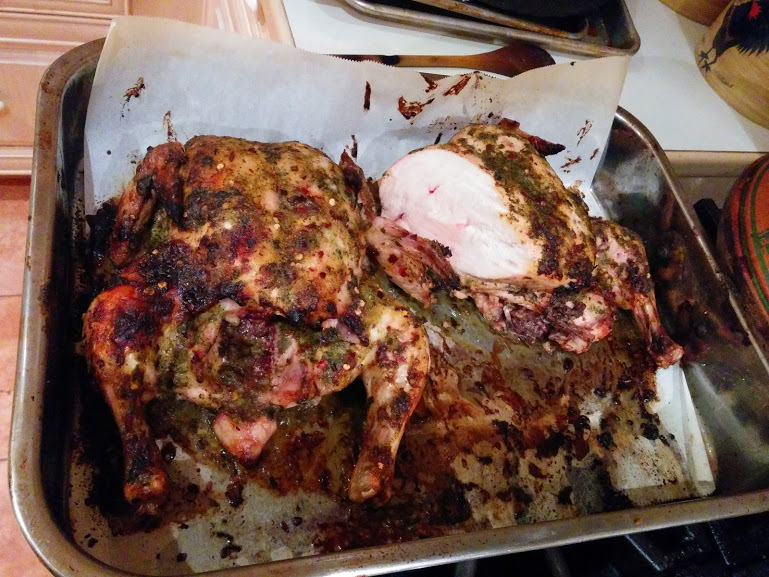 Carve chicken and top with remaining chimichurri sauce. FYI – For roasting chickens, this is’t the only recipe you can use. Just top it with some garlic, olive oil, salt, pepper, and you’ll have yourself a delicious, fool-proof roast chicken! Heat olive oil in a large skillet over high heat. Add garlic and cook until fragrant. Add green beans and cook for 3-4 minutes until cooked but still crisp. Add salt to taste. Clean, peel, and cut sweet potatoes. Add spices + olive oil and mix until well coated. Bake at 425 F for 20 minutes or until fully cooked. Cook garlic in olive oil over high heat. Add broccoli, onion powder, soy sauce, and crushed chilli peppers (if desired). Cook for 3-5 minutes until cooked but still crisp. Cook 1.5 cups of quinoa in 3 cups of boiling water. Bring to a boil and then cover and reduce to low heat for 15 minutes. Allow quinoa to cool. Mix in all other ingredients. Feta is quite salty so no need to add additional salt. Place the honey and agave in a small sauce pan and heat on low for 2-3 minutes stirring constantly. The mixture should be warm and thinner than when it was at room temperature. Add vanilla extract to honey and agave mixture. Mix oats, puffed quinoa or cereal, almonds, and flax in a bowl. Add wet ingredients to dry and mix. If required, add more honey or agave directly to the dry ingredients. The mixture should be sticky but not wet. Place mixture in a 9×13 pan lined with parchment paper and ensure that the mix is flat. I usually press down hard with a small baking tray. Top with chocolate chips. You could also top with raisins, craisins, or anything else you can think of! Place in the refrigerator for at least 2 hours. Cut in bars and serve! EDIT: A lot of people have been asking about mixing nut butters into these granola bars. Natural peanut or almond butter work great! Leave any other questions you have in the comments section. I’m happy to provide clarification on anything.